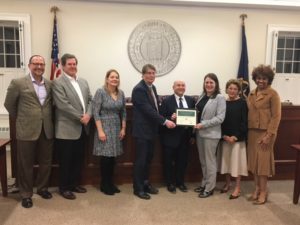 Bedford, N.Y. – The New York League of Conservation Voters and Sustainable Westchester presented a Gold Certificate recognizing the Town of Bedford and Supervisor Chris Burdick for being a leader in greening its municipal fleet of vehicles pursuant to the groups’ Zero Emission Vehicle (ZEV) Pledge. In 2017, NYLCV and Sustainable Westchester developed the ZEV Pledge to engage local governments in Westchester on the environmental and cost benefits of electric vehicles, along with the opportunity to electrify their local fleets and set an example for other municipalities. The Town of Bedford committed to the ZEV Gold Pledge, the highest level, to electrify at least 10% of its light-duty local fleet by 2020, a commitment the town has already exceeded. Transportation is now the largest source of greenhouse gas emissions in New York State. Westchester County has tremendous potential to be a model for other places in the state to reduce transportation emissions. There are 650,000 registered vehicles in the county and enthusiastic local leaders like Supervisor Burdick are setting a positive example for residents and other municipalities to go electric. For the past three years, NYLCV and Sustainable Westchester have been partnering to promote electric vehicles in Westchester. In addition to the ZEV Pledge, the groups held a public forum in White Plains last year to identify additional opportunities to green Westchester’s transportation sector. They continue to engage New Yorkers by encouraging residents to test-drive an EV and asking families with more than one vehicle to switch one to electric.